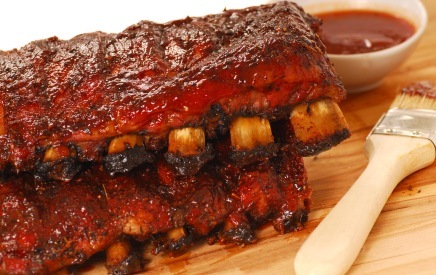 I have fantastic pork rib recipes (beef rib recipes too) that feature the best homemade barbecue sauce recipes and meat rubs. You may grill ribs or bake ribs - they come out perfect every time. Place ribs in a stock pot and fill with water. Add quartered onion and bring to a boil. Simmer for 1 hour. Place barbecue sauce ingredients in a sauce saucepan and mix well. Bring to a boil and simmer for 15 minutes on low heat. Take ribs out of the water and place in a 9x13 pan. Cut ribs between the bones. Pour the sauce over all, cover with foil and bake for 30 minutes. Here's another variation that's sure to please. They taste the best if marinated overnight in the refrigerator. Place ribs in a large stock pot, add the herbs and cover with water. Bring to a boil and simmer for 60 minutes. Mix the sauce ingredients together. When the ribs are done, place in a large bowl and pour the sauce over all. Cover with saran wrap and chill in the refrigerator overnight. The next day, grill the ribs and pour the sauce from the bag into a pan. Heat to boiling and simmer sauce for a few minutes. Serve hot over ribs before serving.